The maiden issue of UCMPs paleontology journal, PaleoBios, was published on June 15, 1967 and highlighted David Whistlers article on Oreodonts of the Tick Canyon Formation, Southern California. PaleoBios may not be in the same league as the higher-profile journals Nature or Science, but a look at its past reveals its unique nature. Most scientific journals are run and sponsored by large professional societies (e.g., the Society of Vertebrate Paleontology (SVP) publishes the Journal of Vertebrate Paleontology (JVP) and the Botanical Society of America (BSA) publishes the American Journal of Botany). The editorial staffs are made up largely of university faculty and staff, with layout and printing contracted out to professional services. 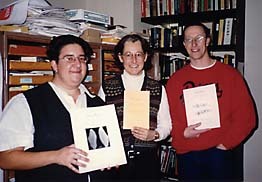 In contrast, two graduate students, David P. Whistler and John H. Hutchison (now Curator of Vertebrates at Los Angeles County Museum and retired UCMP Research Paleontologist, respectively), proposed the idea of PaleoBios as a means for both graduate and undergraduate students to gain hands-on experience in the publication process. In fact, Whistler and Hutchison thought PaleoBios should be run entirely by the graduate students. The current PaleoBios crew (from left), associate editor Amy Lesen, editor Diane Erwin, and layout artist Dave Smith, shows off some old and new copies of the journal. thought it a good idea and offered Museum sponsorship to make it a real publication, though initially there was very little Museum oversight. The UC Library, looking for UC publications to exchange with other libraries, offered further support and soon distribution was wider than originally envisioned. In order to encourage subscriptions, the cost of the series was kept to a minimum by restricting the size of the journal to a 6 x 9 inch format and figures to line drawings (as opposed to photographic illustrations). This philosophy continued from 1967 through the pivotal year of 1987 when there was a dramatic change in style and format. Then editor Jennifer A. Hogler published the first full-page volume (no. 43).